Oberon is a wheat ale fermented with Bell's signature house ale yeast, mixing a spicy hop character with mildly fruity aromas. The addition of wheat malt lends a smooth mouthfeel, making it a classic summer beer. Made with only 4 ingredients, and without the use of any spices or fruit, Oberon is the color and scent of sunny afternoon. Everyone says it gets worse every year, I think Bells responded for 2015. Look: Pours a pale orange/amber with tons of sediment with a thin one finger head, minimal lacing. Smell: Smells tart like a sour ale, slightly sweet malt, and strong yeast. Taste: Tastes only slightly sour and very light. Strong yeast notes and middle bodied malt, very drinkable but flavorful. Wheat in the malt is prominent. Feel: Very light and drinkable, moderately heavy carbonation. Overall: This beer is perfect for summer. Tart but not sour, light but flavorful, wheaty but drinkable. Overall a very solid brew. Appearance: A hazy Orange, likely caused by the Polyphenoles in the Saaz Hops used to brew this fine summer beer. Nice off white head. Loaded with yeast. Taste: hard candies and sweet breads, hazelnuts soaked in orange juice and laced with edible flowers, Christmas dried oranges, maybe cloves too. Almost no wheat in either the smell or taste. This beer is all fruit and flowers. Mouthfeel: Creamy and smooth with just enough carbonation to make your tongue tingle without having a bite. Drinkability: High, very high. Easy on the stomach, mind, and palate. 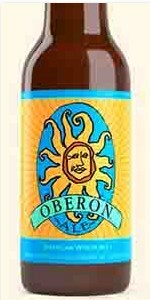 Notes: Oberon is significantly more creamy and more aromatic on tap than in the bottle. Also, it is better in the spring/early summer than in the fall/late summer. In spring it is crisper and the aromas are more flowery whereas the beer begins to smell more of rotten oranges by September and loses something in its body. The mouthfeel, smell, and drinkability all suffer. I just get sick of it by fall. It's now October 12th and last night I had what will be my last pint of Oberon for the season. It tasted, looked, and felt like Miller Lite with a few drops of Blue Moon in it. This is definitely not a beer that ages well. Drink it young and early! T: malty light brown sugar and wheat with malts. F: Full mouthfeel that drinks so well but causes some trouble in my stomach. Avoid drinking this with fried food as there is some volitile reaction that happens. Overall: It's a very well rounded beer. The unpasterized side of things doesn't agree with my stomach, so I am biased in that regard. Looks a slightly hazy orange with a great looking head and lacing. Tastes immediately of wheat with a malt undertone. Hints of fruit/citrus near the after taste. Great flavor, moderate body, and perfect for a summer day. This is my favorite beer and I always look forward to its release every summer. This is the perfect beer to drink while sitting around a campfire or after a long day of work while you bar b que some steaks or burgers. Oberon is a seasonal beer and I had this for the first time. It tastes so good and is on my top list of my favorite beers. I added an orange to the beer after I poured it into a glass. It was delicious! I recommend this beer to anyone who likes a lighter beer and a beer that is not super dark. I am a fan of lighter beer. Bell's Oberon pours delicious with the density of orange juice and a blush of a peach martini. Towering head of 3 fingers, leaving spotty lace amongst a couple broken webs. Aroma is weak in volume but the characteristics are there - honey-tinged wheat, salted pretzel, peeled orange. Flavor is rich and wheaty, touches of orange peel, with wheat thins and pretzel. It's incredibly refreshing, undoubtedly creamy, and has a great semi-dryness on the finish. Bell's Oberon is a great adventure. I imagine I'll be picking more up this summer when we cross the border to camp in Iowa. Nice work again, so glad I could try this. Massive amounts of foam after pouring from a 12oz bottle. It is a deep gold / orange color that is a bit hazy. Smells of various citrus fruits and aroma hops. There is a strong bready / yeasty scent as well. There is a hop bitterness at first, but it quickly fades into a very wheaty / malty flavor. The tastes then turn towards tart fruit and sweetness. There are spice notes throughout that keep the flavor very interesting. Medium mouth feel. Feels fairly thick and syrupy with a lot of tongue tingling goodness. I really enjoyed this as it is different than all of the other "orangey wheat summer beers". This is a bit more interesting than many I have had lately and I would definitely buy this again. I grew up in Michigan, but never had one of these when I lived there. Definitely recommend. This poured a nice gold with a 2 inch head in a wheat beer glass. Nice lacing. As inviting as it appeared, I was somewhat underwhelmed with the taste. It was a nice, lightly sweet, lightly spiced flavor. Very mild hops on the front. The smell was almost nonexistent for me. I probably wouldn't go this way again. It was, however, certainly refreshing with a zest that could squelch the summer heat. Three things signify the beginning of Michigan's summer: the end of hockey playoffs, 80 degree weather and the release of Bells Oberon. I know people that go crazy for it but I'm not one of them. I think it was perhaps the first craft beer to really emerge on the Michigan beer scene 10+ years ago and therefore has a historical significance to Michigan beer drinkers. It told us that it was ok to put the Bud Light down and try something new. With respect for what it is and to its success, it's not my favorite but it's decent. You get a blend of citrus notes and some rich wheat malt on its own but gets a boost when the bartender adds a slice of fruit to it. This beer means summer is here in MI. Very not certain slightly citrus flavor of paired with an orange wedge. Very refreshing. Cloudy appearance. Sediment in bottles. Excellent wheat. I love this beer! One of the more delicious wheat beers out there. Some say it is overrated, but I say HOGWASH! This beer is frikkin delicious! Just try this beer....you will not be disappointed! Finally getting Bell's products in Texas. Bought a six of this and Two Hearted Ale. Both good beers! This one was poured into a tulip glass. Cloudy yellow color with decent head and good lacing. Nice citrus sweet smell. The taste is bready with cinnamon and fruit. Nice beer overall. A: Gold, extremely cloudy and full of ... stuff. The stuff seems to be suspended like dirt in a lemon jello. Actually looks kinda gross, but whatever. No head to speak of. Meh. S: Smells sour, overbitter, too grainy. Reminds me of cheap beer. This doesn't look good so far. T: Tastes rather awful. I think this one might have gone bad. But Bell's Brew Finder says it should be good until November, so I can't be blamed. Reminds me of the bland German beers I've tried, with extra bitterness and less sweetness. Pretty awful - was expecting a lot more. Aftertaste of dirt. Maybe I've lost all taste for wheat beer. M: Overcarbonated, medium-light body, astringent, dry. Doesn't help the flavor. D: I can't drink any more. I'm going to pour it out. Maybe I have a bad sample, maybe I just don't like this style, but I can't stand this one. It's not worth the pain to me. Bright orange-yellowish color with small suspended yeast particles floating around, has a small white head that doesn't last, light citrus aroma, light bready, malty flavors it leaves a flowery aftertaste.It has a very creamy and full mouthfeel, not as spicy and fruity as I remember, still very enjoyable and refreshing. This American wheat beer pours a bright yellow amber with a creamy white head that sticks around throughout. The nose is quite light, with wheat, clove and a touch of coriander -- in some ways, this smells more like a Belgian witbier than a German-style wheat beer. Maybe the only thing missing is orange peel? The taste is quite pleasing, with plenty of citrus notes up front, followed by some doughy yeast, nice acidity, and a hop-based tingle at the end. Very well balanced. Perfect body, nicely acidic, flavorful. This one's a winner, and it gets bonus points for being a wheat beer from America and not sucking. Appearance: Poured from the 12 oz bottle into a weizen glass. The beer is a bright and hazy orange color typical of the style with a very tall slightly off-white head. Some golden hues shine through. Smell: Heavy citrus aroma, orange obviously but also some lemon. A grassy and pretty clean note finishes out the aroma. Taste: Immediate sensation of assertive citrus flavor, followed by a wheaty, almost grassy note. Sweet, but not too much so. Very consistent all the way through. Overall, this was a good refreshing drink perfectfor relaxing with on a hot day. This would be great to just take a 6-pack to the beach and just hang out for a few hours with. Subtle, but still nice and flavorful, this is a good beer. Pours out a hazy, golden color. There's about two and a half fingers of fizzy, white head. Some floating particles also make an appearance. Lacing was somewhat lacking, but overall the appearance was pleasing. Smell wasn't overly exciting. Definitely grainy, with a citrusy zest to it. The taste was much the same. A hint of citrus complements the wheat well in my opinion. The beer was very smooth and pretty fizzy. I could probably drink these all day if I had the money. I would defintely recommend this beer. Appearance: Poured from a 12oz bottle into a large wine glass. Pours a hazy golden/yellow with a frothy one-finger head. Average head retention and lacing. Not much carbonation to speak of, although my view is slightly obstructed by suspended yeast bits. Smell: Smell is pretty subdued, with a pretty even balance between citrus and bready yeast. The wheat is definitely a player as well, but the aroma really isn't that complex and doesn't bowl me away. Taste: Very creamy texture and a refreshing blend of wheat and citrus fruits. There is a bit of bitterness, but nothing about this beer is overpowering; in fact, it almost seems a bit muted. I guess they're going for a summer thirst-quencher, but I'd like a little more zing. Mouthfeel: The mouthfeel is really pretty pleasant. Medium-bodied, creamy, and a tartness that excites the senses. Pleasant is the operative word here. Drinkability: Pretty easy to toss back a couple of these. The fact that no one aspect of this beer sticks out makes it fairly unoffensive to the palate.